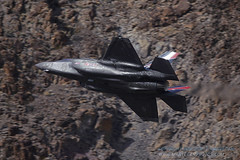 Red Flag is an exercise that was started by the United States Air Force (USAF) at Nellis AFB in 1975 to give its pilots the first ten combat missions of their career. Air Force studies from the Vietnam War showed that if a pilot survived their first ten missions, then they would have a higher survivability rate for all future missions. If a pilot could receive these ten missions in a controlled training environment, then they would know what to expect in real combat. Thus, the 414th Combat Training Squadron Red Flag was created. Red Flags have been so successful that exercises are also being held in Alaska to get more training. In order to fully immerse the pilots into a realistic combat scenario, aggressor squadrons were established to simulate real threats that allied pilots would experience. The allied force is known as the blue force, and these aggressors are known as red threats. There are various aggressor squadrons ranging from aircraft squadrons, to ground threats, to intelligence squadrons. Part of Nevada Test and Training Range (NTTR) that is used for the Red Flag exercises contains plenty of ground threats that the pilots will engage. There are simulated surface to air missiles (SAMs) as well as enemy convoys, radars, and facilities. Smokey SAMs are used to simulate a missile launch and give the signature smoke trail of a missile launch. Today the 64th Aggressor Squadron flies F-16 Fighting Falcons painted in various Russian style camouflage to simulate the Mig-29. They not only fly aircraft painted like Russian aircraft but also fly tactics commonly used by Russian and Russian trained forces. Some visiting F-15 Eagle, F-5 Tiger II, and T-38 Talon squadrons have also provided additional aggressor aircraft to the exercise in the past. In addition, a private company called Draken International is starting to provide A-4 Skyhawk aircraft for the aggressor role. What started as an USAF exclusive exercise has now grown into a fully integrated exercise that includes units from all of the US’s armed forces. The USAF brings a wide variety of aircraft that include fighter aircraft, attack aircraft, bombers, command and control aircraft, reconnaissance aircraft, electronic warfare aircraft, search and rescue (SAR) aircraft, airlift aircraft, and aerial tankers. The United States Navy (USN) will bring in some jammers and patrol aircraft as well. The United States Marine Corps (USMC) may also deploy an attack squadron as part of the strike package. The US Army doesn’t usually participate in a large scale for Red Flag since it is mostly an air exercise, but they have Green Flag exercises where air units provide close air support for their ground forces. They have deployed Patriot missile batteries out in the ranges in the past as well as provided some helicopter squadrons for some training. Also, in some Red Flags, our allies are invited to join to in the exercise to train as a fully joint coalition of aircraft that is common in many combat scenarios today. Past participants have included the United Kingdom, Australia, Germany, Italy, Sweden, Norway, Turkey, Israel, Jordan, Japan, South Korea, Singapore, Pakistan, and India. In order to control the entire exercise, there is a white force that monitors the battle. The white force uses the Nellis Air Combat Training System (NACTS) in order to keep track of all the aircraft in the exercise and to keep track of the simulated kills between the blue and red forces. Every aircraft is equipped with the Air Combat Maneuvering Instrumentation (ACMI) pod on one of its weapon stations. This pod sends out signals of various weapon launches to the aircraft that is being pursued and to the white force. If immediate action is not taken, the simulated weapon will kill the opponent and the fight will be over. The blue force only gets one chance in the exercise, and if they are killed they have to return to base. The red force gets to regenerate after a short amount of time if one of their aircraft are killed. This ensures that there is always some enemy threat in the sky, especially since there are so many more blue aircraft participating in the exercise. Red Flag will continue to ensure that our pilots have the best training opportunities for combat. If the United States is ever engaged in a war, our pilots will have an excellent sense of what they can expect. Also to stay with growing technology, Red Flag is adapting for the future. Cyberspace threats are also being factored into the exercise. The growing world of sophisticated computers is also allowing missions to be “flown” from the ground from computer simulators. This allows the aircrews and the USAF to minimize the amount of flying hours on their aircraft which is certainly a concern with the older, high hour aircraft. No matter the enemy threat, or sophisticated development in technology, Red Flag will continue to adapt to provide the premier training exercise for our pilots in the future as it has since its creation. © All rights reserved. All Photos Copyright 2010-2017 Bob, Steven, and Scott Mantegani.